Gabrielle Union is 46 and killing it. Currently starring alongside Jessica Alba in “L.A.’s Finest," the actress juggles her career, family, and fitness like a pro. So just how does Union manage to keep it all together? She makes self-care a priority, not only by maintaining a healthy diet and exercise regimen, but also by setting aside quality time for her family as well as herself. Here is everything Union does — including what she eats and drinks as well as how she sweats — to make 40-something look like 20-something. Union describes her approach to diet as “it is what it is,” however she does stick to a healthy eating plan. During the week, when on the set of her show, she eats good fats and maintains a gluten-free, dairy-free, and low-sodium diet. The actress first started eating like this in early 2018 while dealing with IVF side effects, including intense bloating. Alisa Vitti, a functional nutritionist and women’s hormone expert, helped get her back on track. “She said, ‘Cut out gluten, dairy, alcohol, and caffeine and see if the swelling alleviates and it helps with your skin and hair,’” says Union. “I felt like she was trying to torture me.” However, after a few days she noticed a huge difference. Union told Us Weekly that she makes sure to get in at least two servings of leafy greens every day, including lettuce, spinach, kale and swiss chard. When snacking does happen, it comes in the form of unsalted almonds, which she carries with her all the time. Sure, there’s “nothing fun” about them, but they “edge off the hunger pains” she told Everyday Health. She also told the website that a “beet, carrot and kale pressed juice probably every other day” is on her radar. There is one vice that Union refuses to give up: alcohol. While temporarily eliminated as part of her nutrition's recommended restrictive diet, the star admits to Women’s Health that she won’t be giving it up again. Union drinks a whopping gallon of water a day, usually tap, and sometimes with lemon. "It's just important to get the water in," she told Fitness Magazine about the importance of hydration. "If you can replace sugary drinks, or coffee, with water, you're still ahead of the game." One of the ways Union keeps her mind right is indulging in the occasional cheat meal, which she describes as “eating what the hell I want and not thinking about it.” She chose her Women’s Health interview as one of those days, ordering garlic Parmesan fries, chicken wings. Um, yum! She told Fitness Magazine that other of her go-to splurges include cupcakes, cookies, pancakes and bacon. Union makes sure to do 15 to 20 minutes of daily cardio, as well as strength training and Pilates, to keep her body fit and her head clear. She tries to get her workouts in during the morning, as it works better with her schedule, but admits sometimes it’s hard to get out of bed when the alarm goes off. She's only human, after all! She also does interval training. “It’s the best thing for your heart and it’s the best thing to either kick start your weight loss or maintain your weight loss,” she explained. Her go-to routine is jogging at level 5 for a minute, dropping down to 3 to bring her heart rate back down, up to 5.2, drop it back down, and then back up to 5.5. “Aim for at least six rounds of jogs, walks, and if you are in a little better shape, do sprint/walks, and you’re walking with a higher pace as well. So if you took it up to 7 and you’re sprinting, then your recovery should be 4 or 4.5,” she advised. 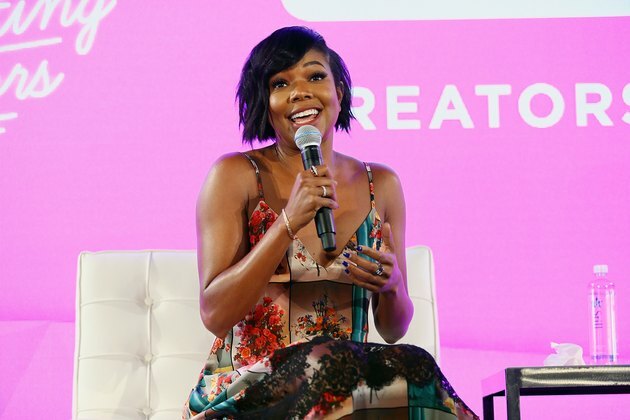 While Gabrielle Union is seriously devoted to healthy living, her approach is actually quite reasonable and totally doable — even for us civilians!